Diabetic retinopathy is damage to the back of the eye (retina) caused by complications of diabetes, which can eventually lead to blindness. Diabetic retinopathy can develop in anyone who has type 1 diabetes or type 2 diabetes. The longer you have diabetes and the less controlled your blood sugar is, the more likely you are to develop diabetic retinopathy. Diabetic retinopathy usually affects both eyes. Depending on your signs and symptoms, diabetic retinopathy may be classified as early or advanced. Early diabetic retinopathy. 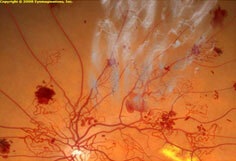 This type of diabetic retinopathy is called nonproliferative diabetic retinopathy (NPDR). It’s called that because at this point, new blood vessels aren’t growing (proliferating). NPDR can be described as mild, moderate or severe. 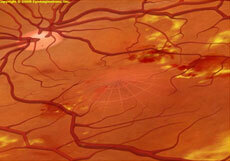 When you have NPDR, the walls of the blood vessels in your retina weaken. Tiny bulges called microaneurysms protrude from the vessel walls, sometimes leaking or oozing fluid and blood into the retina. As the condition progresses, the smaller vessels may close and the larger retinal vessels may begin to dilate and become irregular in diameter. Nerve fibers in the retina may begin to swell. Sometimes the central part of the retina (the macula) begins to swell, too. This is known as macular edema. Advanced diabetic retinopathy. Proliferative diabetic retinopathy (PDR) is the most severe type of diabetic retinopathy. It’s called proliferative because at this stage, new blood vessels begin to grow in the retina. These new blood vessels are abnormal. They may grow or leak into the clear, jelly-like substance that fills the center of your eye (vitreous). Eventually, scar tissue stimulated by the growth of new blood vessels may cause the retina to detach from the back of your eye. If the new blood vessels interfere with the normal flow of fluid out of the eye, pressure may build up in the eyeball, causing glaucoma. This can damage the nerve that carries images from your eye to your brain (optic nerve). Vitreous hemorrhage. The new blood vessels may bleed into the clear, jelly-like substance that fills the center of your eye. If the amount of bleeding is small, you might see only a few dark spots or floaters. In more severe cases, blood can fill the vitreous cavity and completely block your vision. Vitreous hemorrhage by itself usually doesn’t cause permanent vision loss. The blood often clears from the eye within a few weeks or months. Unless your retina is damaged, your vision may return to its previous clarity. Retinal detachment. The abnormal blood vessels associated with diabetic retinopathy stimulate the growth of scar tissue, which can pull the retina away from the back of the eye. This may cause spots floating in your vision, flashes of light or severe vision loss. Glaucoma. New blood vessels may grow in the front part of your eye and interfere with the normal flow of fluid out of the eye, causing pressure in the eye to build up (glaucoma). This pressure can damage the nerve that carries images from your eye to your brain (optic nerve). Blindness. Eventually diabetic retinopathy, glaucoma or both can lead to complete vision loss. Diabetic retinopathy is best diagnosed with a dilated eye exam. For this exam, your eye doctor will place drops in your eyes that make your pupils open widely. This allows your doctor to get a better view inside your eye. The drops may cause your close vision to be blurry until they wear off several hours later. Measure your eye pressure to test for glaucoma. 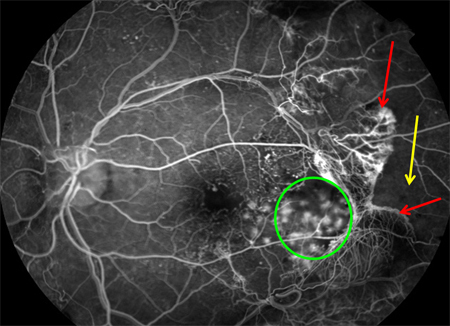 As part of the eye exam, your doctor may do a retinal photography test called fluorescein angiography. First, your doctor will dilate your pupils and take pictures of the inside of your eyes. Then your doctor will inject a special dye into your arm. More pictures will be taken as the dye circulates through your eyes. Your doctor can use the images to pinpoint blood vessels that are closed, broken down or leaking fluid. Your eye doctor may request an optical coherence tomography (OCT) exam. This imaging test provides cross-sectional images of the retina that show the thickness of the retina, which will help determine whether fluid has leaked into retinal tissue. Later, OCT exams can be used to monitor how treatment is working. Treatment depends largely on the type of diabetic retinopathy you have. Your treatment will also be affected by how severe your retinopathy is, and how it has responded to previous treatments. If you have nonproliferative diabetic retinopathy (NPDR), you may not need treatment right away. However, your eye doctor will closely monitor your eyes to determine if you need treatment. It may also be helpful to work with your diabetes doctor (endocrinologist) to find out if there are any additional steps you can take to improve your diabetes management. The good news is that when diabetic retinopathy is in the mild or moderate stage, good blood sugar control can usually slow the progression of diabetic retinopathy. Focal laser treatment. This laser treatment, also known as photocoagulation, can stop or slow the leakage of blood and fluid in the eye. It’s done in your doctor’s office or eye clinic. During the procedure, leaks from abnormal blood vessels are treated with laser burns. Focal laser treatment is usually done in a single session. Your vision will be blurry for about a day after the procedure. Sometimes you will be aware of small spots in your visual field that are related to the laser treatment. These usually disappear within weeks. If you had blurred vision from swelling of the central macula before surgery, however, you may not recover completely normal vision. But in some cases, vision does improve. Scatter laser treatment. This laser treatment, also known as panretinal photocoagulation, can shrink the abnormal blood vessels. It’s also done in your doctor’s office or eye clinic. During the procedure, the areas of the retina away from the macula are treated with scattered laser burns. The burns cause the abnormal new blood vessels to shrink and scar. Scatter laser treatment is usually done in two or more sessions. Your vision will be blurry for about a day after the procedure. Some loss of peripheral vision or night vision after the procedure is possible. Vitrectomy. This procedure can be used to remove blood from the middle of the eye (vitreous) as well as any scar tissue that’s tugging on the retina. It’s done in a surgery center or hospital using local or general anesthesia. During the procedure, the doctor makes a tiny incision in your eye. Scar tissue and blood in the eye are removed with delicate instruments and replaced with a salt solution, which helps maintain your eye’s normal shape. Sometimes a gas bubble must be placed in the cavity of the eye to help reattach the retina. If a gas bubble was placed in your eye, you may need to remain in a facedown position until the gas bubble dissipates — often several days. You’ll need to wear an eye patch and use medicated eyedrops for a few days or weeks. Vitrectomy may be followed or accompanied by laser treatment. Eye Injections. Injection of medication into the vitreous fluid in the eye may be effective in treating wet macular degeneration, diabetic retinopathy and broken blood vessels within the eye. For example, to treat wet macular degeneration, periodic injections of medications directly into your eye may help stop disease progression. In some cases, this treatment may help to partially recover vision. Surgery often slows or stops the progression of diabetic retinopathy, but it’s not a cure. Because diabetes is a lifelong condition, future retinal damage and loss of vision are possible. Even after treatment for diabetic retinopathy, you’ll need regular eye exams. At some point, additional treatment may be recommended. Call us at 915-261-7011 to set your appointment today. We care about your eye health as much as you do. Peace of mind with detailed, expert eye surgeons. State of the art equipment and technology. Most Affordable LASIK eye surgery in the area. Whether you are seeking to have a condition diagnosed, already have a diagnosis and want to learn more about your treatment options or simply want a second opinion, you have come to the right place. When you come in for your consultation, our friendly and knowledgeable medical staff will ensure that you that get all your questions answered and are informed of all your options. If you or someone you know has been affected by a severe or chronic eye condition, you know just how much poor eye health can impinge on one’s quality of life. Even more minor conditions, if untreated, can profoundly interfere with one’s everyday activities. Here are LASIK, Cornea and Cataracts Specialty Center, our doctors, are highly qualified and extensively experienced in the treatment of all eye-related conditions and diseases. When it’s your vision at stake, you can’t afford to take chances. You want the very best eye care the El Paso southwest has to offer. Very professional and caring staff. I was very comfortable with all phases of my individual treatment and the doctor was very informative about his expectations for all tests and surgical procedures. I received first class attention by everyone at all of their locations. I am a patient of Dr. Guenena, and I have had a rather severe eye issue that he has treated me for over the span of several months. The level of care, compassion and professionalism exhibited by staff is exemplary, when I come in to the office I am greeted by name and with a friendly smile. When I called for my first appointment the staff member took the time to listen to my problem and placed me on hold, after conferring with the doctor she asked if I could come in within the hour, that’s customer service! I was looking for a new eye doctor and decided to try this place due to how close and convenient they are. I am thrilled with their service. The staff was friendly, polite and did all they could to assist me. The doctors were friendly and explained everything very well. Their pricing was good and the quality exceptional. I have recommended LASIK, Cornea & Cataract Specialty/Eye C Optical to my family and am very happy to finally have a eye center I trust. Copyright © 2018 Lasik, Cornea & Cataract Specialty Center. All rights reserved. Website optimized by Lasik, Cornea & Cataract Specialty Center. Any issues with website please contact webmaster at marketing@corneaelpaso.com Disclaimer: The information contained within this eye care website is not intended to be taken as medical advice. The information provided by Lasik, Cornea & Cataract Specialty Center is intended to provide general information regarding LASIK, cataract, laser surgery, glaucoma treatment, medical retina problems and more to El Paso and throughout the nearby areas. If you are interested in finding out more, please contact us today for a personal consultation. We're sorry we're not around right now. But you can send us an email and we'll get back to you, ASAP. I consent to Lasik, Cornea & Cataract Specialty Center collecting my details through this form.